If Opera VPN enabled Google shows Russian content - PC Buyer Beware! The Opera web browser provides a connection to a free VPN (Virtual Private Network). 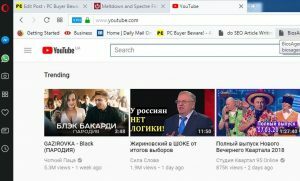 The image above shows the home page of Google’s YouTube site displaying Russian-language content. You can see Opera’s VPN icon in white letters and a blue background in the left-hand side of the browser’s address bar, next to the encryption lock that makes the site a secure, encrypted https site. (An insecure site uses http.) This means that the free VPN is enabled in Opera’s settings. (It is not enabled by default.) As you can see, www.youtube.com is in the address bar, but the search took me to the YouTube UA (Ukraine) site. The Ukrainian language and Russian are spoken by most Ukrainians. The image below shows a Google Account login that is in Russian when the Opera web browser is used with its free VPN enabled. More proof that the parasitic globalist establishment and its media and social media are using Russia to scare people off from questioning or seeing what they are getting up to. Truly pathetic! Why is this happening to the Opera VPN? Google is mainly a server of ads on the websites. In order to provide customised ads, it creates personal profiles of web users. Google’s computers know the names, addresses, ages, friends and Internet IP addresses, etc., of a huge number of web users that could be measured in hundreds of millions or even billions. Therefore, anything that does not allow it to identify web users is going to be costly because users are far more likely to click on customised ads than random ads or ads based on the content of the webpage. Google’s AdSense ad system used to be based purely on website-page content. However, it soon evolved into using personal profiles built up from information derived from Google’s search engine and websites that serve its ads, its own websites, such as YouTube, and its free software, such as Gmail. In short, everything that Google offers for free gathers data about the users. Just recently I have noticed that Gmail is producing a message asking for permission to read my emails, which, of course, I refuse. Therefore, the only reason for displaying Russian content must be to make users come to the conclusion that the VPN is using web servers in Russia. The conclusion that I came to myself until I gave it a little thought. Russia has been built up in the West as a haven for hackers and cyber criminals. So, the intention must obviously be to make users abandon using VPNs. What gets my goat the most about Google and Facebook is that they use your personal information to customise ads making billions of dollars in profits every year, but also use tax havens in order not to pay any corporation tax in the countries in which they operate. To find out where the web servers a VPN uses are all you have to do is visit a *global* broadband speed-testing site, such as speedtest.net. 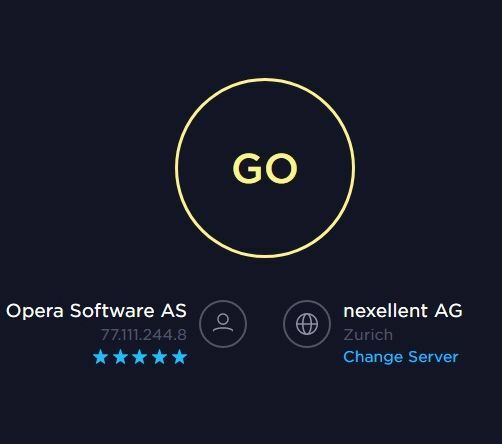 It tells you the upload and download speeds of your connection in megabits per second and the location of the VPN’s web servers.. In my case, it was in Zurich, Germany, not Russia, as shown in the image below. The “Change Server” option shows alternative servers, which, in my case, were all in Germany. Therefore, Opera’s VPN is not leaking the IP address provided to my connection by my Internet Service Provider (ISP). The US Democrats use Russia as an excuse for all of their failings, including losing the election to Donald Trump. The mainstream media in the US and UK were backing Hillary Clinton almost 100%. When Clinton lost, without any proof, the Democrats blamed the defeat on Russians for handing over damning emails by Clinton and the Democratic National Committee (DNC) to Wikileaks. The blaming was widely reported by the mainstream media. However, NONE of the damning content was ever revealed, because it was so damning. This is biased journalism of the lowest kind. Now it’s March 2018 and the UK government and the UK’s mainstream media are singing from the same hymn sheet in blaming Russia for the chemical-agent murder attempt on a former Russian spy and his daughter. The spy was in prison in Russia for years before he was exchanged for spies spying for Russia. The whole thing just doesn’t add up, especially given that there was a Russian general election just after the attack and Russia is holding the football World Cup – the biggest event in the world – in the summer of this year. Therefore, using Russia as the fall guy to get their way by politicians and now Google is becoming predictable and boring. These people, who are in positions of authority, are clearly intellectually bankrupt.